It's hard being friends with a saint. Let's say you agreed to meet in front of Comet Ping Pong to go to a record fair at 1:30 p.m. Time goes by, and soon it's 1:40, 1:55, and you start to wonder what's up. Turns out your friend had a met a homeless person who asked her for money, and she responded by buying him lunch and they are eating in the Chinese restaurant across the street. So you walk over to meet her, and she says, "Take a seat. This is Andre, he's been telling me stories about how he wants to be a mortician." I'm a Christian and I try to be a kind person, which for me means being friendly with cashiers, maybe helping someone on crutches with a broken foot open a door, etc. Nothing that takes me out of my comfort zone too much. But my friend Serena sees the humanity in everyone and can strike up a conversation with anyone, without artifice or pretense. She goes out of her way to help people. I think that is inspiring. It's the radical version of Christianity that Jesus taught. Anyway, the record sale! I'm sure you were wondering about that. 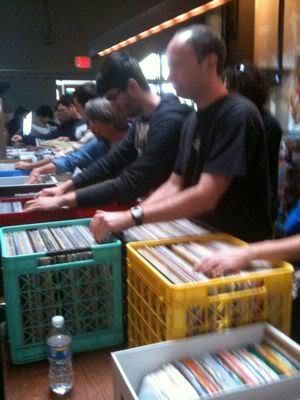 Lots of cool music geeks pouring over crates - not sure what they are looking for specifically, but they were hard at work. Some little girls were playing ping pong outside and I heard a snippet of their conversation. "Those things in there are called records. Not CDs," one girl said sagely as the others nodded. "And the music that is playing? 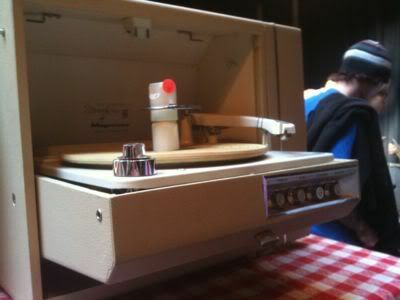 They're playing it on records." October 5, 2009 by Adele Chapin.